The Esrange Satellite Station includes six independent Telemetry Tracking & Command (TT&C) systems in S-Band (one with receive capability also in the UHF-Band), six multi-frequency receive antenna systems in S/X-Band and an operational building which houses reception system electronics and data processing equipment. Esrange Satellite Station is manned 24/ 7 and has abundant space available for antenna and equipment expansion to accommodate our growing customer base. Esrange Satellite Station is located at Esrange Space Center above the Arctic Circle at 67º 53' North latitude, 21º 04' East longitude and approximately forty kilometers outside the town of Kiruna, Sweden. The location is particularly advantageous for accessing polar-orbiting satellites and the Kiruna station emphasizes data acquisition and processing for remote sensing and scientific missions as well as TT&C support. 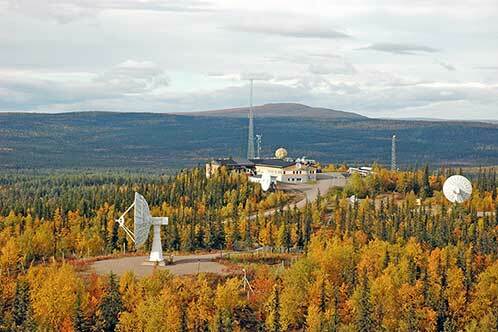 The “Kinuvik” combination - Inuvik, Canada, plus Kiruna (Esrange Satellite Station) - offers the capability for satellite contacts on all orbits during one day. It also provides the benefit of possible long duration passes which significantly increases the amount of data that can be downlinked from polar-orbiting satellites.